Asahi Garage, owned and operated by Fred M. Tada and K.N. Namba, was located at 318 E. Second St. in Little Tokyo. My father, James Tsutomu Yamamoto, was in auto sales for decades, most recently at Prince Chrysler Plymouth in Inglewood. I knew my dad was well regarded in the business and had a lot of experience, but another press release in the folder was totally unexpected: It was from April 1936, when Dad was only 9 years old. “Out in Los Angeles, where the Japanese colony is very large, the Chrysler Sales Division of the Chrysler Corporation has an all-Japanese agency that caters exclusively to the numerous Nipponese in the territory. “The Asahi Garage is the name of this unique agency and it is owned and operated by Fred M. Tada and K.N. Nanba. The business was founded in 1927 and has been very successful. 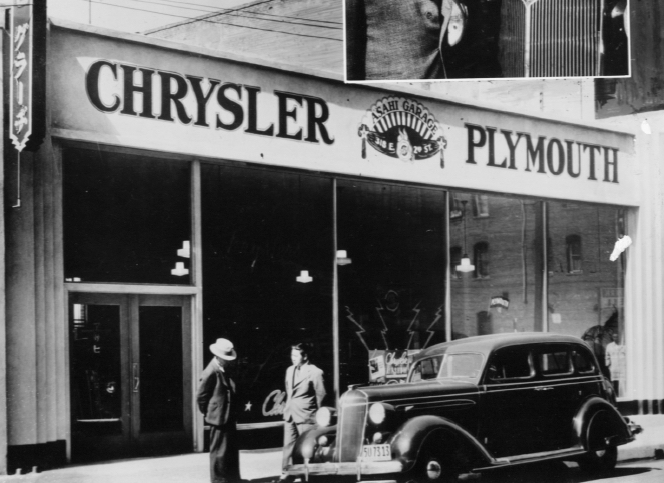 “Because of the popularity of the 1936 Chrysler and Plymouth lines among the transplanted sons and daughters of the Mikado, it is estimated by the proprietors that this year’s sales will be considerably in excess of those of any previous year. “All employees of the Asahi Garage — salesmen, the two office girls, and the service men — are Japanese. Both Mr. Tada and Mr. Nanba are thoroughly competent automobile men who know the Chrysler organization. Their service mechanics are well trained, too. “All in all, the organization is making a big hit among the Japs of Southern California, who welcome the chance to do business with people who speak their own language and understand their customs and psychology. Judging from the use of “Jap” and the “Mikado” reference, I assume this wasn’t written by a Japanese American. It does show how common the slur was, even in a non-derogatory context. (A newsreel describing the 442nd Nisei as “American Japs” comes to mind.) Anyway, I don’t know which local papers carried the article, and if The Rafu did, whether they edited it or not. It was too late to ask Dad why he had the article in his folder, but Mom said that Dad might have known Mr. Tada and Mr. Nanba, and they might have helped him get his start in auto sales after the war. The location of Asahi Garage was 318 E. Second St. in Little Tokyo, the present location of Gong Cha, between San Pedro Street and Frances Hashimoto Plaza. A 1940 map of Little Tokyo shows Asahi Auto Sale Co. at that location. Neighboring businesses included Bentley Hotel, Sun Electric Hardware, Taisho Plumber, San Francisco Hotel, Tomoye Hotel and Nippon Printing on that side of the street; New York Hotel, Asahi Hotel, Fedora Hotel, Oshio Transfer Co., Mutual Supply Co., Kyodo Shohin, California Daily News (Kashu Mainichi), Toyo Shojisha Co. and Toyo Printing across the street. It was a thriving neighborhood that would turn into a ghost town in 1942. Since Asahi Garage was such a “big hit,” I wonder if anyone out there remembers going there or meeting Mr. Tada and Mr. Nanba. J.K. Yamamoto has been with The Rafu Shimpo since 2010. He can be reached at [email protected] This article originally appeared in the 2018 Holiday Issue.